In 1870, Jules Verne published 20,000 Leagues Under the Sea, an instant classic of Victorian science fiction that took readers a fantastical journey beneath the waves with dreams of wondrous technologies. A century later, filmmaker Stanley Kubrick directed 2001: A Space Odyssey, a classic of modern science fiction film that took viewers on an even more fantastical journey into the stars…and showed them not only the wonders of technology, but also its terrors. Now, in good speculative fiction style, ten authors will bring readers along on a journey that combines the two. Whether diving beneath the waves or sailing among the clouds, readers of 20,001: A Steampunk Odyssey will see how technologies of a past that never was can spring to life with all the wonder of futures that might never be. Some futures are darker than others, however, and the cost of discoveries and innovation may be higher than any human being is willing to bear. 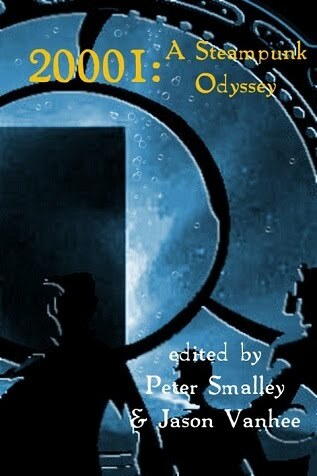 In this anthologie readers will find aspects of both Verne and Kubrick: wonders and terrors await, and discoveries and adventures lie around every corner – not all of them pleasant. Find out for yourself what you will dare, how much you will risk, and how far you may go in this anthologie of ten tales of wonder and imagination. 20,001: A Steampunk Odyssey!